This piece of information was more than enough to leave us totally intrigued, curious and super excited to visit Gue Village in Spiti. We bid goodbye to Kaza on April 29th and embarked on our return journey to New Delhi. However, we still had three more destinations to cover – Gue, Nako and Sangla. So far, so good!! And we had a huge 1100 kms distance to cover until we reach home so had to stay positive and strong. However, Spiti is one region where the flurry of surprises never ends; you cannot predict what you’ll encounter next. This fact serves like a natural morale boost for explorers like us and therefore though the journey was challenging we carried on with panache. 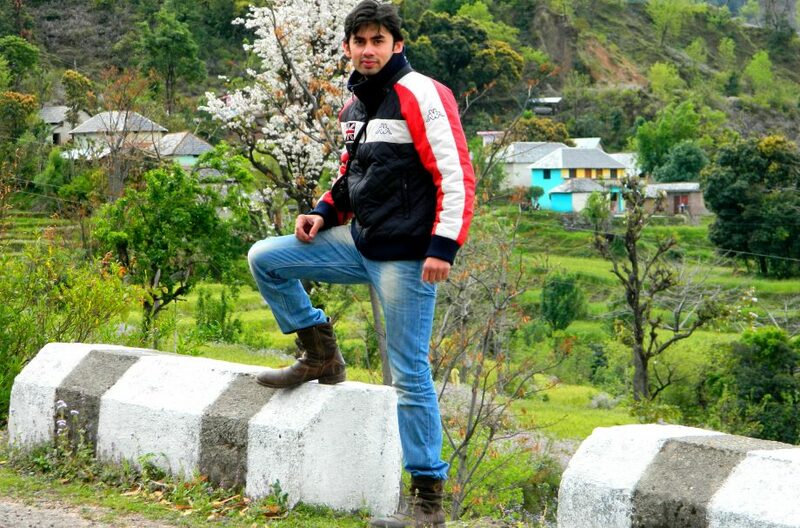 Gue, is a high altitude tiny hamlet located at a distance of roughly 40 kms from Tabo village. The road is beautiful and mostly well maintained. The day we were traveling we did not see a single vehicle moving towards Gue barring ours!! However, got used to this feeling 🙂 We observed change in the pattern and color of rocky mountains as we approached the village. The mountains adorned copper color as if they were meticulously painted. When we reached the Village…. The village had an eerie silence; the wind gave special effects reminding us of the movie ‘Hills Have Eyes’!!! When we entered the village we could not spot a single soul!! We were looking for someone to confirm the way to Monastery that houses ‘Mummy’. However the huts / houses, Tibetan flags, scripted / inscribed stones made us comfortable. The inscribed stone thing is very peculiar to Tibetan culture; I’m going to cover the carving culture exclusively in another post. I believe the stones are hand scripted. The place looked beautiful and there were many things that distracted us from directly going to the Monastery. We could observe bright and colorful Monastery perched on top from a distance and assumed this must be the one. We kept ascending with the road to reach there. The wind pressure increased, it became little frosty too and somehow we both felt so dehydrated up there!! We both were feeling something, I’m not sure if this was just a psychosomatic discomfort but the moment we reached the premises we felt quite different, there was something in the stillness of the place. Unlike other monasteries we visited so far, this one seemed fairly new!! And yes it was. The structure was painted with bright red, blue and green colors, totally aesthetically appealing. One particular thing about the ‘Monastery’ was firstly the shape was unlike what we have seen at other places and secondly the dragon-like faces at the four corners. Moreover, I wish I could understand what was written on the walls there. So, after peeking through all over two floors of the Monastery like structure and waiting for someone, we still had no luck L the circumstantial evidence reflected the interiors were still in the making. The structure was vacant and there were cartons lying in the corners. Just when we were about to get moving (reluctantly though), the little cemented room in proximity caught our attention. It looked like a watchman or security personnel’s room. It had glass windows, so we decided to sneak peek in search of some luck. And voila!!!! ‘There it was, the Mummified Lama – Sangha Tenzin’!!! We were as much as excited as astonished; we did not anticipate this feeling. The word ‘Mummy’ – evokes visuals of embalmed body wrapped in linen. This is what we all have seen of Mummies, haven’t we? But this is different and special too. Sangha Tenzin, was a Buddhist Monk, who adopted a process of natural mummification to salvage his village from scorpions scourge. His soul abandoned the human body more than 500 years ago and what is left is mummified body.The self mummified monks are also known as ‘Living Buddhas’. Sangha Tenzin’s mummified body was discovered in 1975. It was found safe when the Stupa that was housing him collapsed during an earthquake. It is believed that in advanced stages of mummification the monk would stay in specially built tomb and sit in meditation state (I’m guessing he spent his last days in the Stupa). Post that, the body was shifted to Gue Village and surprisingly the body has shown minimal deterioration. The hairs is intact and the teeth too. The sitting position reflects a meditative state as if he is contemplating something. It’s just incredible as it seemed he will get up any moment and come up to the window to talk to us!!! Natural Mummification is really complicated and rare phenomena. The process is known as ‘Sokushinbutsu’. Wiki defines – Sokushinbutsu refers to a practice of Buddhist monks observing austerity to the point of death and entering mummification while alive. This process of self-mummification was mainly practiced in Yamagata in Northern Japan between the 11th and 19th century, by members of the Japanese Vajrayana school of Buddhism called Shingon. The practitioners of Sokushinbutsu did not view this practice as an act of suicide, but rather as a form of further enlightenment. Researchers have been able to discover self mummified monks in the mountains of Japan’s Yamagata. It is believed that this process was originated by Yamagata Buddhist monks. What would have happened more than 500 years ago? Still can’t believe, self mummification!! How did he and other Monks could gather courage to do it? Is it possible while we are here, somewhere in the world, a distinguished Monk is attempting a mummification process? With lot of unanswered questions in our minds we left the village and continued our road trip. The visit to Gue was one of the most memorable experience of our 11 days long road trip from New Delhi – Spiti – and back. Looking to read more about the villages in Spiti? Here you go – Dhankar Heights, Totally Tabo-ed, Super Seven things about Spiti.